He's had almost 30 years experience in the wrestling business, performing for the likes of WWE, TNA, USWA, WCW, CWA, WCWA against the likes of Edge, Kurt Angle, Cactus Jack, AJ Styles, Sting and Samoa Joe, winning the NWA World Heavyweight Championship six times, the WWF Intercontinental Championship six times, the WCW United States Heavyweight Championship three times, the WWF World Tag Team Championship, the WCW World Heavyweight Championship four times and the WWF European Championship amongst countless others. 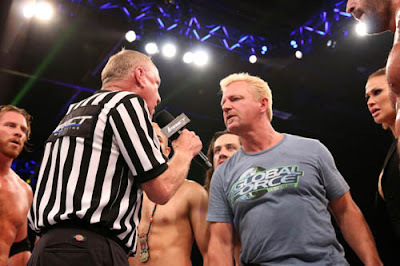 Now, Jeff Jarrett sits down with ATPW to talk Global Force Wrestling's UK Invasion tour, their television product Amped, his appearances for PCW and much much more. 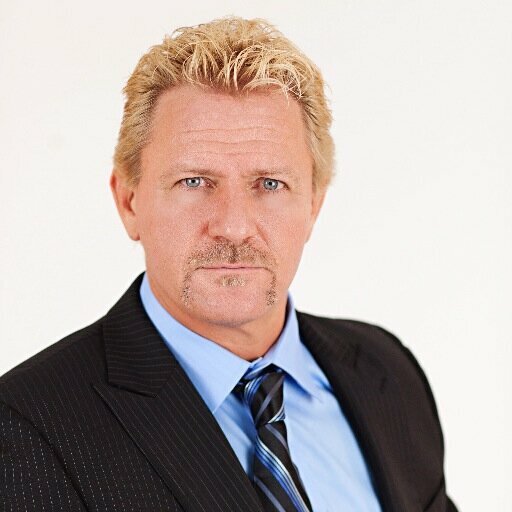 ATPW: If there was anyone out there, unfamiliar with Jeff Jarrett, perhaps a younger fan that's only seen you on TNA television over the last few months, how would you describe yourself as a performer? Double J: Describe myself? You know, I'll leave that to the journalists, the critics, the writers, to describe who, what, where and when I am. With the technology we have with Wikipedia, GlobalForceWrestling.com and all the different websites, there's plenty of info out there on my career. But I'm very happy, I feel that I'm very blessed that I'm in my 29th year in this business. My families been in this business since the 1940s. My Grandmother didn't wrestle but she did just about anything else; promoted, she started selling tickets as a side job and worked her way up to what you would call a CFO. My Dad promoted first and then he wrestled, then he went back to promoting for many many years. Then I got into the business as a very young man and helped out around the business; setting up rings, refereeing, working the concessions, selling programmes, whatever was needed at the shows. My first match was in April 86. 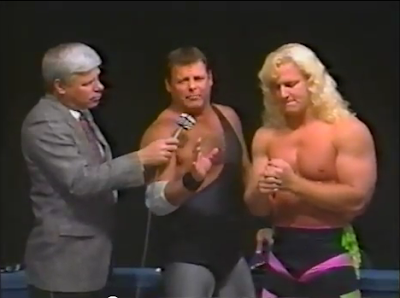 I wrestled in my father's promotion, a regional promotion, for seven or eight years, and then I went to work for the WWF. Worked for WWF and WCW until Vince McMahon bought his competition and then I founded TNA Wrestling in 2002 with my father. Resigned from their in December 2013, a few months later launched Global Force Wrestling and that's what I'm most exited about today. I've more passion and more drive about this business today, than I've ever had. Big congratulations on the Big 3-0 in business coming up next year! What's been the main difference between setting up TNA in 2002 and creating Global Force Wrestling in 2014/15? Well the world is completely changed. Obviously, TNA started as a two hour PPV, Wednesday nights, once a week and that's how we launched. The world of technology and digital and social media, the world has changed. I learned that you have to do things with a methodical, step by step process, you can't rush things, you can't do things over night. Step by step, put the pieces together and with social media you're so much more connected to the fan base, than you were in 2002. Quite frankly it's a completely different set of rules, it's a different ball game and one that I like. The accessibility, interactivity, the connection with the fanbase, can happen literally on a minute by minute basis. You've recently returned to TNA for a storyline involving GFW, what was it like being back in the company? Was a difference that you saw between the company you left in 2013 and today? When I launched Global Force Wrestling on a very step-by-step basis, I put together on my entire career of relationships. I formed alliances with promotions on five continents; New Japan Pro Wrestling, the hottest promotion in Japan, AAA, the hottest promotion in Mexico, all through Australia, South Africa, all through Europe. TNA would probably have been on the bottom of the list of promotions that we were to work with, not of my choosing, theirs. But stranger things have happened, they reached out and we did a co-promotion for almost three months and an exchange of talent. I was very excited. It was special, to come back to promotion that I founded with my father. To wrestle in the King of the Mountain match on the anniversary of the company at Slammiversary, that was special, the Hall of Fame induction was special. Then the exchange of talent, Bobby Roode is in the Global Force Wrestling Heavyweight Tournament. The finals are on October 23rd in Vegas. It's really been healthy, I believe, for both promotions and I think it's a direction that we're going to continue to go down, in terms of working with as many different promotions as we possibly can. Is there a plan to continue that cross-promotion with TNA? Or is that all done with the end of that storyline? At this time, it has come to a close, but I believe the doors are open, but only time will tell. GFW has a big TV taping coming up on 23rd October at the Orleans Arena in Las Vegas, what can fans in attendance expect when they come to that show? The first one was the historic, the second one was off the charts, with the BULLET CLUB and the Killer Elite Squad, this one is going to top that. When I say historic, it's going to be, four, actually five, a tag and three singles, wrestlers are going to make history. The Global Champions going to be crowned, the Next*Gen Champions going to be crowned, the Women's Champions going to crowned and the tag Champions going to be crowned. It's going to be a historic night. It's something that I'm super excited about. We've got some really, really cool promotional videos coming out, that really amp up and lead into that Friday night. So the people who are that show truly will be witnessing history. 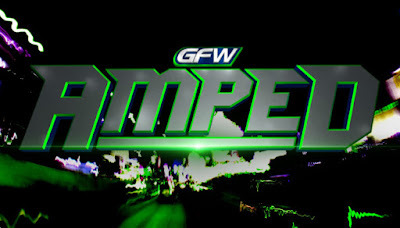 How is GFW Amped going to be different from other television products currently available (WWE, TNA, Lucha Underground etc.)? Well, you can't completely reinvent the wheel. There's going to be a six sided ring and set-up in the middle of the ring. There's going to be hard hitting action from bell-to-bell without question. We've got saying in our production studio, "We don't write stories, we're going to document them", because every athlete in GFW and literally every athlete that get's into this business, there's a real authentic story behind them, why they do what they do. What do their spouse or boyfriend/girlfriend or peers or parents, what's their reaction to them in this business. Why do you want to be in this business? What drives you? What are you aspirations? What are your goals? So we're documenting this and organically conflict comes out of that, cos there can only be one champion in each division and everybody's shooting for that prize. Everybody's got, in this business, an ego on some level and when you puts egos in the same room, the same ring, you're going to have conflict and we're going to document that. You're going to get a real sense of that in the next coming weeks, as you see the promotional pieces, that we're going to putting on our Youtube channel. When can people expect your show to start broadcasting? Are we any closer than we were three months ago when the first taping took place? Absolutely, absolutely. From the business side of things, I've made no secret that it has been a real challenge, cos the name of our brand is Global Force and when we're not just a US based company and when you're talking to broadcasters, literally, from around the world, multiple countries, multiple territories, and the US being just one of them, it's been a challenge to sync things up, but we've made great progress over the last three months and expect to make some announcements in the coming weeks and months.These announcements I'm very excited about. The distribution partners that we're talking to are major league and we're very very excited about it. Towards then end of this month, GFW is holding the first "UK Invasion" Tour, what is going to be different with those shows, as opposed to what we can get elsewhere here in the United Kingdom? Well, number one and again, I don't want to make too much about it, but it's very special to me, it's very special to Nick Aldis, it's very special to the Global Force athletes that are going to be on the very first UK based shows. So that makes it very very special. The VIP's if they're not already sold out, they're very very close to selling out. To come out that night, on one of the shows you're going to be able to see Nick Aldis, a homecoming. He left as a kid and he's coming back as a world reknown professional wrestler. He's a man and he's honed his craft over the years, that's going to be very special for the company, me personally, obviously Nick personally, he's getting to come home. Our mind-set is different from other promotions, the London's, the Manchester's, the Birmingham's, the Sheffield's, the traditional cities where US companies go, we made a real concious effort, that we understand that we're a brand new brand and these are our first shows so we wanted to go into a market where they hadn't seen major league wrestling. So far, the data that we've recieved we've made the right decisions, from the attendance and getting into these markets and we're already looking at 2016 shows in the United Kingdom. As well, the locations of the tours that caught my eye, the ticket prices for these shows also stood out. Was it a concious decision to go in at a lower price point than WWE and TNA? Absolutely. This is business. It's about black ink vs. red ink. Building the brand. Realising that we are a brand new brand. We want the people to come out, have a great time, enjoy the product and then tell their friends and then when we come back we'll have even bigger crowds. That's exactly how promotion works. You can out price yourself out of a market real quick, that is something that we consciously made an effort not to do. You're actually scheduled to compete yourself on the Tour. What was the decision behind that? It's actually an obvious one and a not so obvious one. As you know, I'm not wrestling on the Amped show, I am the promoter, as well as the Grand Slam shows. But the partners we have in the United Kingdom approached me and they thought and they gave me their reasons why they thought, that I should wrestle. The pros far outweighed the cons and so I agreed to. It's got tremendously good feedback, which I'm grateful and thankful for. 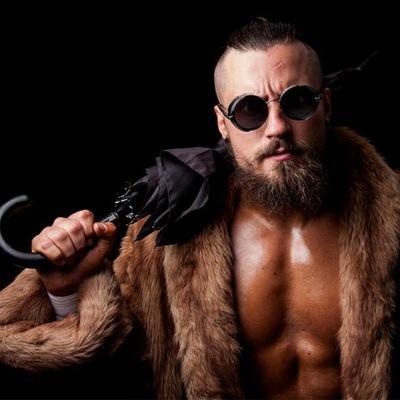 But we'll see, but don't expect me to make me, at this stage of my career, my full-time wrestling days are behind me, but for the first shows, they thought it would be a historic set of circumstances and I agreed to do it. You've got three different promotions you're working with in the UK (Premier British Wrestling in Scotland, New Generation Wrestling in Hull and Revolution Pro Wrestling in Southern England), are we going to see more interaction between GFW and those companies in the future? I'm looking forward to it. Doug Williams has been a great friend, first and foremost, but also a great liaison. I'm positive that these shows are just the beginning of where Global Force and the UK are headed, but as you stated earlier, the UK independent scene is red-hot and Global Force is ready to be a part of it. You've got a number of British-based talent lined up for the UK Invasion tour, was their a selection process that went into which wrestlers got the call? With any Global Force show, me and my team, we take a hard look at everything. At the Grand Slam event tours, this past summer in the US, we had major international stars like the BULLET CLUB and Sanada and the Killer Elite Squad, guys that are global stars, but also right down the local level, the independent promotions in each market or regional stars in each market. We do everything from global to local and everything in between and that's exactly what we did here. Party Marty's on the show, a legend in the UK Doug Williams, we made sure we wanted to tap into the UK fanbase and bring them stars that they'd seen and put them on the same stage as the Global Force Wrestling stars. Back in April you appeared for Preston City Wrestling and you're scheduled for more appearances on Halloween, what did you make of the promotion? There was a lot of fan interaction, which I like. They run a great operation. I can't even think of what the chubby dudes name is...MASTIFF! He probably has biten off more than he can chews, he thought it was fun and games and it wasn't fun and games. If anyone was there that night, they are well aware that...Dave probably, being politically correct, stepped his toe into something that he shouldn't have. I happened to be there and the atmosphere was certainly interesting. Yeah. That may be an understatement! If you someone told you you could only wrestle on more match, who would you like it be against? Again, that's a question I'll let you decide. Over the years, going back to the early days, me and Jerry Lawler wrestled against and as tag partners. Then the early WWF days, Shawn Michaels, Scott Hall, Kevin Nash, Road Dogg and then you go onto the WCW days and the World Title reigns and the early TNA days and a young AJ Styles. Then as you go through the years and I think at that stage in my career, I had a series with Kurt Angle that I'm very proud of. I'll let you decide out of that group. When you've been wrestling 29 years, there's a huge pool of guys to pick from, so I'll let you guys do that. To close, after nearly 30 years in the business, do you have any regrets? No. That is something that...you live and learn, so to speak. It does no one any good to regret and look back. I believe it's just time to move on, live and learn. It's something that is so fundamentally simple. I don't think that you should have regrets even though everybody does on some level, but I've tried to juggle many different balls over the years, whether it be promoting, whether it be family life vs. the business life. Life is about a balance, sometimes it gets a little out of whack, you've just gotta keep on keeping on and moving down that down that round. A huge thankyou to Jeff Jarrett for taking the time to talk to us. We'd like to wish Jeff and everyone at Global Force Wrestling the very best for the UK Invasion Tour and heading into the future. Tickets are still available from the GFW Amped Television taping in Las Vegas, Nevada and can be purchased from this link, with prices between $35-$125 with numerous packages available. Tickets for the UK Invasion Tour can be purchased here - Grimsby Kings Lynn. Tickets are between £14 and £20 with Meet and Greet packages also available. Tickets to see Jeff Jarrett at PCW on October 31st can be purchased here, with various pricing options from between £15-£120.